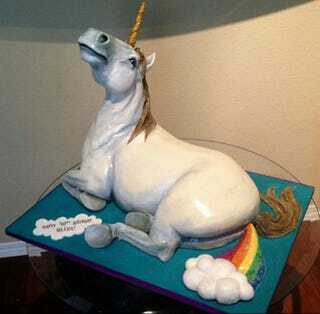 Here is a cake in the shape of a unicorn farting rainbow farts. You are welcome. This beautiful cake that is the fulfillment of all your secret dreams and hopes was made by woman named Natalie, who has taken all the beauty that exists in the world and shaped it into this cake for Sideserf Cake Studio. Now go forth and bring this magic into your dreary lives. Let it be forever known that on this day, the world was graced with a unicorn rainbow fart cake and all as we know it was forever changed.